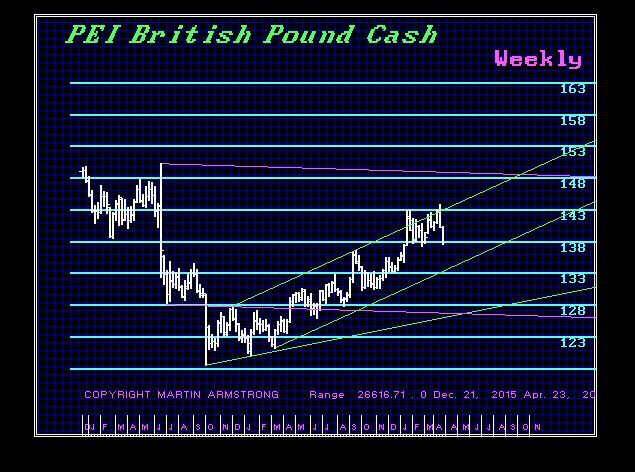 QUESTION: You models called for a rally in the pound sterling into April and it seems like that is spot on. We did bounce off of the 144 level. In your year-end report, you said the resistance in the pound for 2018 was at the 14500-14600 level throughout 2018. Living here in Britain, I really get a laugh out of these people who keep saying the dollar is in a bear market forever. They are clueless about what is going on outside the United States. I know you are not, but the view of Americans from across the pond is they are ignorant of anything outside the States particularly the Goldbugs who are notoriously wrong for decades. So has this begun to turn? ANSWER: Granted, there are a lot of Americans who see the world only in dollars and the United States. They usually hate my guts because they have been wrong. Yes, we came close to the resistance level, but we still did not reach it. This is part of the consolidation period that was broader than just the stock market. Capital as a whole has been confused and trying to figure out which direction everything is going. BREXIT is it on or off has been an ongoing question. Gold has run up and then runs down. It too has been unable to breakout out. This is yet another confirmation of the entire overall consolidation pattern our computer saw for early 2018. People have to get their head around interest rates. Will rising rates be bearish for stocks, bonds, and everything else? So much opinion and propaganda have been spilled out for decades that people cannot see clearly. In the pound, we elected 3 of the four Weekly Bullish Reversals – not the fourth. We elected only ONE Monthly Bullish and the next one stands at 14775 level, which we have been unable to reach. So how anyone can claim that the dollar is in some long-term bear market is just bias because that is what they WANT to believe, which is usually so their gold will rise. They seem to be the only people who refuse to open their eyes and just peek at the other markets and political trends outside the USA if they even do that. They pray at the foot of their bed every night that the stock market will crash and the world will be brought to its knees in retribution for their lack of understanding. They will never be able to survive what is on the horizon because they are too biased to be objective. They cannot even understand that a weak dollar helps everything and a strong dollar creates the deflation and collapse in debt. The only way to survive is an opinion mind and try to let the markets explain reality. You must always draw a line in the sand and if you cross that line, you exit you trade for you were wrong. If you cannot predetermine where you will be wrong when you enter a trade, you have already lost. Greece got in trouble BECAUSE they joined the Euro, the Euro then doubled in value and their previous national debt then cost twice as much deal with. Hello? Why can’t they get this through their heads? Probably because their mortgages are in dollars. In Canada, Europe, Australia, they alone understand when you borrow in a foreign currency, and the currency rises, you lose money. I Helped some of the takeover boys during the 1980s to converting debt into a PERFORMING asset. We would borrow in a currency that would depreciate against the asset. We made more money on the currency decline than on the asset in nominal terms. Such things are just over their heads. There has to be someone there to take profit on a trade when they buy a high or sell the low.